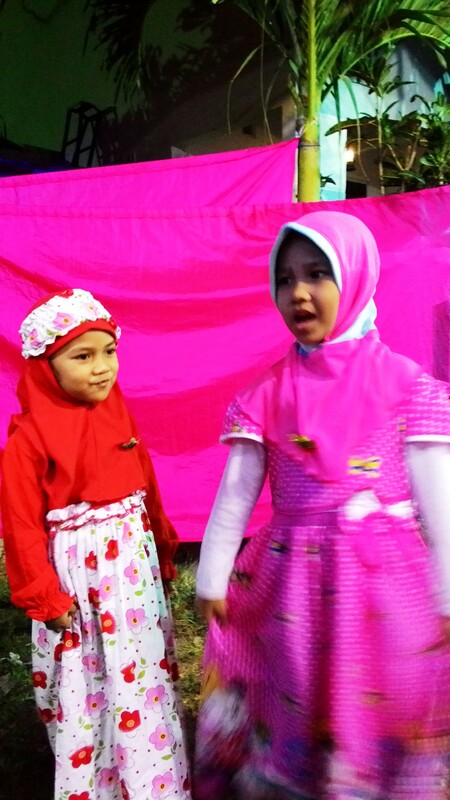 It seems inevitable that when one is in Indonesia, one goes to a lot of pernikahan (weddings). This was certainly my experience last year, and it did not take long for it to begin again this year: I attended my first wedding during my first week at site, prior to even going to orientation, and continued to do so for quite some time following orientation. 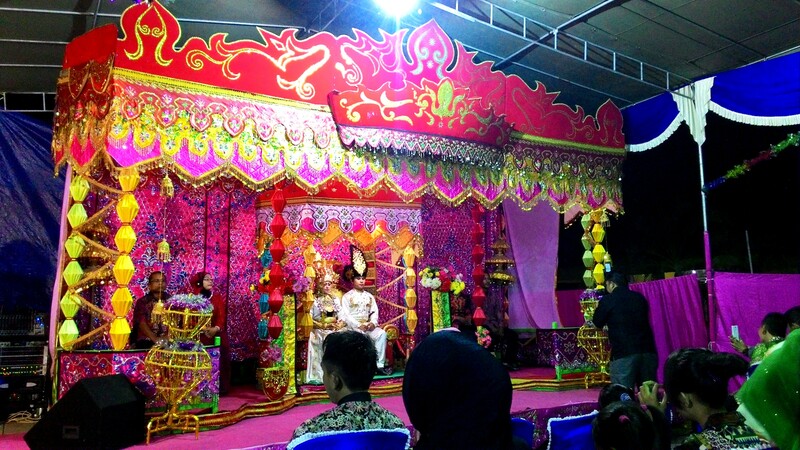 Weddings in Indonesia have always seemed ornate affairs, and if anything they seem to be more so here in Gorontalo when compared to the ones I experienced in East Java last year. 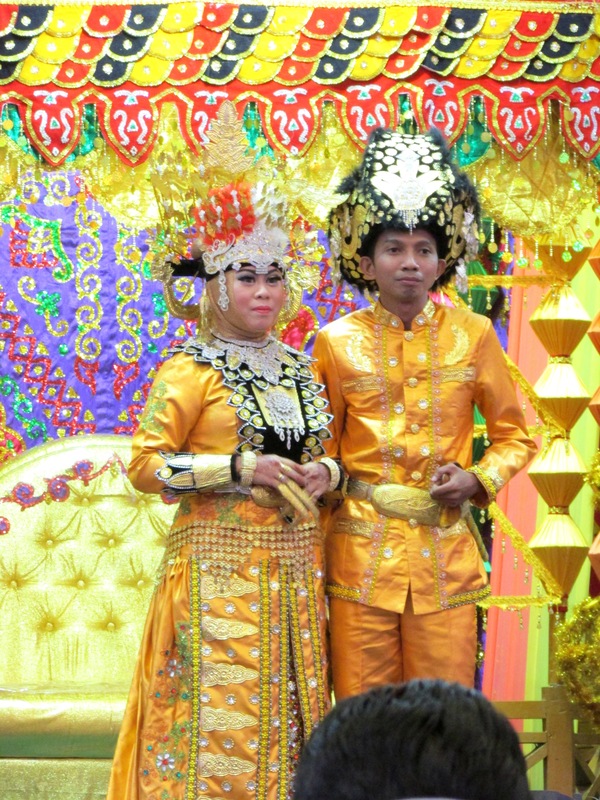 The bride and groom are completely desked out in matching outfits, with elaborate hats and headdresses that come from traditional Gorontalo dress. The parents and other family members are in their very finest—and are often also matching one another—and everyone in attendance, from the smallest child to the oldest Ibu, is wearing their finest; even in my favorite dress from Indonesia—which I’ve taken to calling my “wedding dress” because I always wear it to any wedding I am invited to—I often feel very underdressed. The funds for all of this comes from the family of the groom. While paying an actual “bride price” in the form of cows or goats goes not seem quite so common anymore, or at least not in metropolitan places (Gorontalo is a small city, but it is still a city), it still falls on the man to provide funds for the wedding. The level of extravagance of the whole affair is often directly related to the wealth of the groom and his family. I attended a wedding with one of my sitemates and her teachers that was held in a giant hall, which the couple would have had to rent out, complete with giant fake trees and the largest spread of food I have ever seen at an Indonesian wedding, here or on Java. Most of the weddings I have attended here, one the other hand, are held in tents outside of the family’s home; they are still warna-warni (colorful) and indah (beautiful), but there are certainly no fake trees. I asked one of teachers once what happens if the groom cannot pay for the wedding, and she told me that while in the past that might mean the couple could not marry, now they tend to have what is essentially a court-house wedding at the local ministry of religion. Weddings almost never start on time, in keeping with the jam karet (rubber time) that is so pervasive here. While everyone waits for the ceremony to begin, neighbors catch up on gossip, teenagers play with their hand phones, and young children become progressively more restless until they amuse or annoy everyone around them with their antics. Often there are singers performing pop ballads in various languages, with varying degrees of talent. But sometimes, in between songs or at weddings where there are no performers, the background to the waiting period is just friendly chatter. Once the ceremony actually begins, I don’t usually fully understand what is happening. Different family members speak, and there are various prayers said, that is certain, but I am never sure exactly what is being said, due to the fact that the prayers are in Arabic (a language I do not yet speak) and while I might be able to understand the Indonesian speeches in a different situation, I find it extremely difficult to hear clearly over the sound systems which are always used at weddings. To be honest it, it never seems as though anyone in attendance is paying close attention to what is happening; most continue to whisper to the people sitting next to them or distract themselves with their HP (hand phone, or mobile phone). Meanwhile, I sit peacefully and people watch, and admire the grandeur of the whole set-up, including the extravagant stage the couple and their parents sit on. One of my co-teachers told me that for the wedding night the bed is also decorated in a similar fashion. To be honest, if I were in their place, I’m not sure whether I would find this incredible, amusing, or intimidating. After the actual ceremony is over, various individuals are called up for photos with the couple and their parents. Then, sometimes the bride and groom sit in the ornate throne, and sometimes they change into a second set of wedding clothes, just as colorful as the first. As soon as the first set of photos is finished, however, it is time to eat. People swarm the tables on which the food is laid, and pile their plates with daging, sayur, and, of course, nasi. In my experience, queuing is not a concept in Indonesia. I’m never quite assertive enough for this bit of craziness, and still find the mild chaos a bit terrifying. Then, it is time for a second round of photos, and then everyone goes home. Indonesian weddings are always a particularly interesting experience as a foreigner. Often, I find myself in a position of honor at the wedding, even though I really have no connection to the bride and groom at all. I continue to find this position quite uncomfortable, as I have done nothing to deserve this attention, but I feel I have gotten better at navigating it less awkwardly as my time here increases. While I found myself at a number of weddings during my first month and a half or so here, the invitations seem to have waned. Because it is considered lucky to get married around the time of the pilgrimage to Mecca, there were a lot of weddings in the months of September and October. But now, the Wedding Season is over in Gorontalo, and while this makes everything a little more peaceful, it also makes everything just a little less colorful. I’m sure there are all sorts of prejudices and politics wrapped up in this, but it is reassuring to know that some progress is being made. I’m a hopeless romantic who believes love can conquer all, but I’m also a realist who knows the world is not always kind to love. 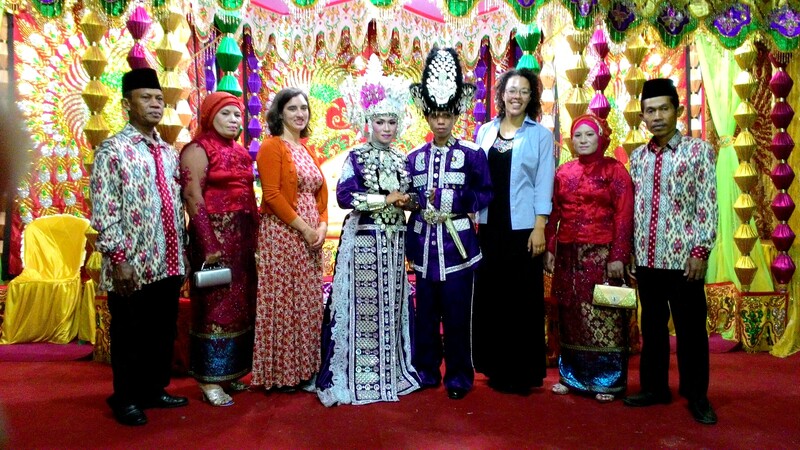 This entry was posted in Indonesia ETA Grant 2015-16 and tagged Culture, Gorontalo, Indonesia, sulawesi, Weddings. Bookmark the permalink.